John Ruskin is hardly a household name, but the English artist, art critic, and social theorist was widely influential among his nineteenth-century contemporaries, and many intellectuals who followed. He was “the foremost polemicist of the Victorian Age,” notes one label in Houghton Library’s new exhibition, “Victorian Visionary: John Ruskin and the Realization of the Ideal.” Beside it, a lithographic caricature from an 1872 issue of Vanity Fair brings out Ruskin’s distinctive physical features: his beak of a nose and bushy sideburns. The bicentennial of Ruskin’s birth prompted the exhibition, which also highlights his unique relationship with Harvard and influence on the institution’s history. 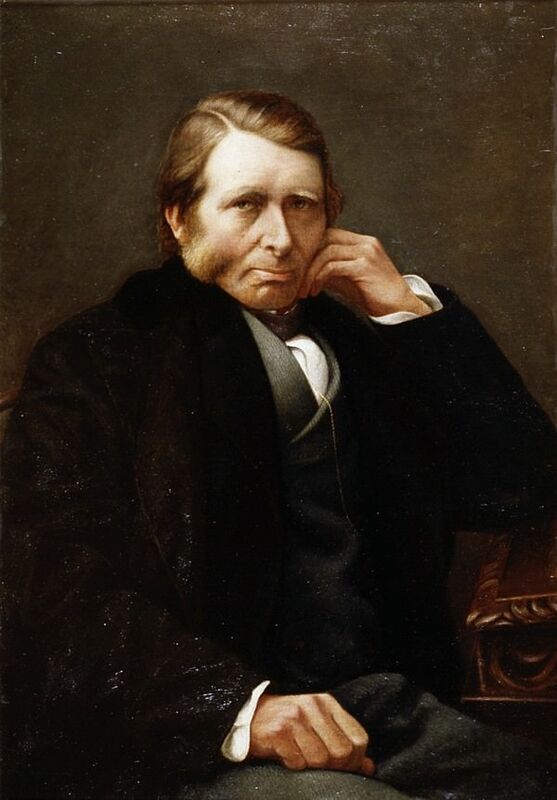 Ruskin was close friends with Charles Eliot Norton, Harvard’s first professor of art history, who had persuaded his cousin—University president Charles William Eliot—to add such a course to the College’s curriculum. Norton had been inspired by Ruskin’s position as a professor of art at Oxford, and “It was through Norton that Ruskin had an impact on the United States,” says Anne-Marie Eze, director of scholarly and public programs at Houghton. Ruskin’s student Charles Herbert Moore was the first director of the University’s Fogg Art Museum. As one of Ruskin’s executors, explains exhibit curator Peter Accardo, Norton collected many of his friend’s works, which now form the foundation of Houghton’s Ruskin collection. Those holdings have been supplemented by donations from R. Dyke Benjamin ’59. The exhibition is also augmented by pieces from other Harvard libraries and the Harvard Art Museums, displaying Ruskin’s books, manuscripts, objects from his daily life, and those of people in his sphere of influence. Objects from Benjamin’s most recent gift, made last year, feature prominently in the exhibit; one of them, a letter Ruskin wrote about the 1867 Reform Act, which extended the vote to working-class men in Britain, reads: “[W]orking men of England must, for some time, be the only body to which we can look for resistance to the deadly influence of moneyed power.” The donation also includes letters by English social reformer Octavia Hill, who received art lessons from Ruskin and, with his financial support, acquired and renovated her first slum properties. With the fortune he inherited from his father, a successful merchant, Ruskin supported a range of utopian projects, such as the Guild of St. George (today an educational trust), a community that aimed to “return to an agrarian way of life” as a tonic against urbanization and mass production. In his four-installment essay Unto This Last, an early copy of which appears in the exhibition, Ruskin censures eighteenth- and nineteenth-century laissez-faire economics and condemns industrialism and capitalism for its attacks on the environment and human well-being. The work was immensely influential on Mahatma Gandhi, and also made an impact, through Gandhi’s paraphrase, on Martin Luther King Jr.
Ruskin’s critique of the industrial economy is connected to his writing on the history of art and architecture: “I am forced by precisely the same instinct to the consideration of political questions that urges me to examine the laws of architectural and mountain forms,” he wrote. He was associated with the Pre-Raphaelites, an artistic movement that stressed direct observation of nature and heartfelt expression of it in art. Ruskin loved medieval Gothic buildings, which he contrasted with the mechanization of factories in the nineteenth century. “This observation came as a revelation as he studied the architectural legacy of Europe, recognizing that earlier craftsmen found greater joy and dignity in their handiwork than their modern counterparts,” explains Accardo. Visitors to the exhibition will find nineteenth-century prints of his influential essay “On the Nature of Gothic Architecture,” embellished with medieval-inspired motifs. John Ruskin, "Study of Stones and Lichens in the glen below les Montets in the ascent to Chamonix"
“Victorian Visionary: John Ruskin and the Realization of the Ideal” is open to the public through April 13.